This is what Kiawah Luxury is all about! From the wrap-around porches with spectacular ocean views to the immaculate interiors and newly remodeled kitchen, this 7 bedroom, 7.5 bath, 7,000 Sq. Ft. home has it all! As you pull into the driveway, you are immediately greeted with the smell and sound of the Atlantic Ocean. 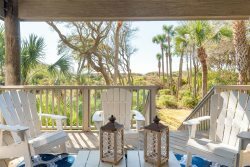 212 Ocean Marsh is only a two-minute walk to the sand. With three stories fully utilizing outdoor balcony space, there are ocean views easily found. You may decide to take the elevator up or ascend the front steps into the large foyer complete with a seating area and flat screen TV. Four of the seven bedrooms can be found on the first floor as well as the fully equipped laundry center. As you enter the house the first bedroom on the left features a king bed and full bath. Meander down the hall to find the other three rooms. A king suite with full bath and access to the screened porch, 2 queen beds with private bath, and another king suite with private bath. The second level of the home is the main gathering place with plenty of room for the entire family! The newly remodeled gourmet kitchen is the ultimate focal point in the open and fantastic great room that also houses the dining room, living room, sunroom, and access to the balconies and panoramic views. There are also two bedrooms on this level. The first has two full beds and a private bath and the other is the master suite with a large flat screen TV, huge modern bathroom with all the amenities one would expect. It even has access to the sunroom through a private door. The third level is a playroom for all ages! Features a 60 inch widescreen TV, Wii game system, board games and puzzles, a full adjustable putting green, ping pong table, projector screen with movie capabilities, amazing views of the ocean and Ocean Course Golf Course, a bedroom featuring two double beds, and a full bath. - This home does not have access to the resort pool areas or fitness center. Love the number of bedrooms and their bathrooms. The kitchen is well equipped and spacious. The house is well located and easily accessible to restaurants and interesting walks. Every time I called it was a very good experience. My only concern was the master bedroom was the only part of the house that did not cool down to the same temp as the rest of the living areas. We couldn't adjust the temp without freezing another entire area. The upstairs of the property was fantastic for our teenagers and kids to hang out. Loved that there were beach toys in the garage. Whitney was very helpful - Both in identifying an appropriate property for our group and in securing the days we wanted. Great follow-up on process and "to - do" items. Furthermore, when we had a problem with an AC Zone, the attention to resolving the problem was excellent. Great experience overall. The recommendation of Chef Tracy Baker was great - she did an amazing job! Would highly recommend her to others seeking in house catering. We enjoyed our stay at 212 Ocean Marsh. It was our 32nd year to spend two weeks at Kiawah! The house was great for a large group. We loved the house and want to rent it again for two weeks in 2014. One thing we noticed was how quiet the house was. The first floor rooms could not hear every step the people made in the room above them. The parking situation was great. We did not have to play musical cars. The following items are available for rental from local equipment rental companies: Baby Equipment, Beach Chairs/Umbrella, Beach Towels, Beach Toys, Bicycles, Golf Carts, Kayaks, Mopeds, Paddle Board, Surf Boards. You can check out our Guest Information tab on our website to review rental policies, check in and check out, and what to bring.